4. Backward to the previous dialogue. Press and hold to fast forward. If main subtitle file is not present, move back 1 second. 6. Forward to the next dialogue. Press and hold to fast backward. If main subtitle file is not present, move forward 1 second. 7. A-B repeat. Press once to mark A ( start point ) and press again to mark B ( end point ) for looping. This is good to study part of a long or fast dialogue, setup an adhoc loop for a scene or for part of a song. 11. Drag down the movie Area and the Search menu would appear. When dictionary tab is selected, you can use it as a basic dictionary. When subtitle tab is selected, you can search a particular word in the subtitle. It would jump to the next dialogue with that word. 1. 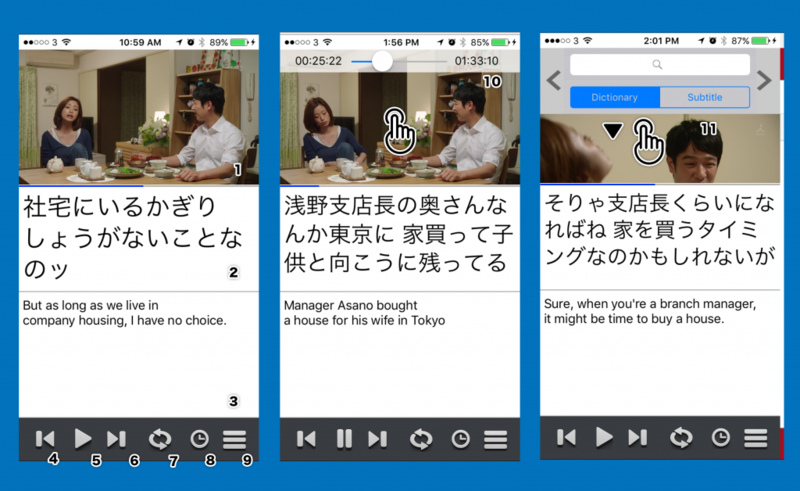 Touch and Drag on the main subtitle would select the word and bring up the dictionary pop-up (2). 2. Dictionary pop-up would show the dictionary meanings for the selected word in (1). You can also do built-in dictionary search, web search from the pop-up menu. Single click on a normal word entry would pronounce the word. 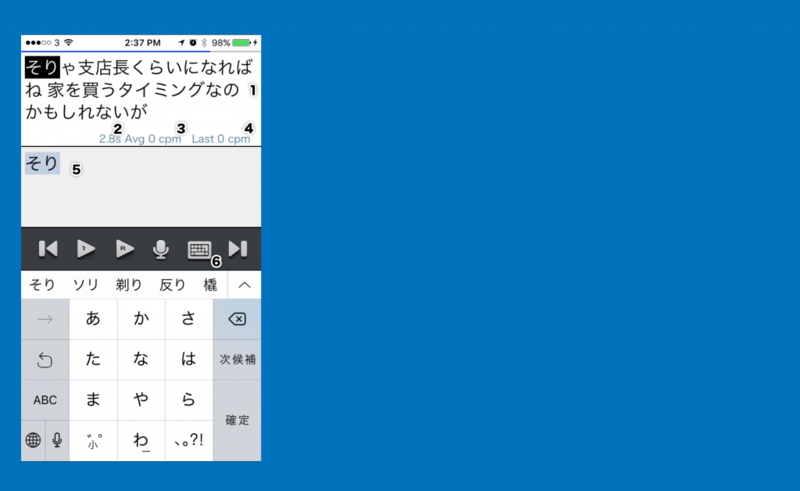 Single click on a Kanji word entry would bring up a web search on Jisho where you can check details of the kanji like strokes, radicals and meanings. 3. Press and hold on the main subtitle would select the longest word recognised and bring up the dictionary pop-up (2). 4. Swipe an dictionary pop-up entry to the left would reveal the vocabulary menu. You can add or delete the word to the vocab quiz cards. The Quiz card would include the word, meaning, whole dialogue text and where it appears in the movie. 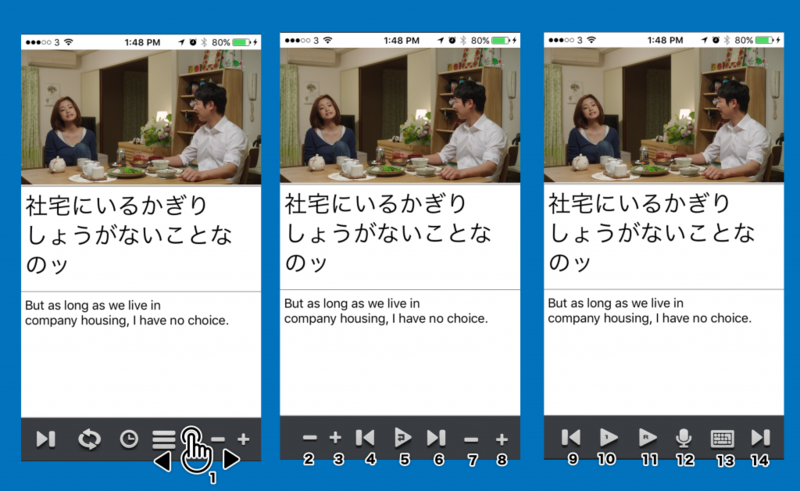 It lets you play the dialogue or that part of movie when you do revision. 1. You can swipe the bottom menu bar to reveal other menu bars. The above shows the “normal menu bar”, “loop play menu bar” and “speaking and typing” menu bar from left to right. 5. Play and Loop the current dialogue continuously. Press and hold to change to Loop Once mode. In Loop Once mode, it would play the dialogue once and stop. Press and hold to change back to Loop Continuous mode. 12. Record your own dialogue. Try to mimic what you hear. All dialogue recorded can be retrieved in the App Shared Folder in iTunes under the folder with the same name as the main subtitle filename. 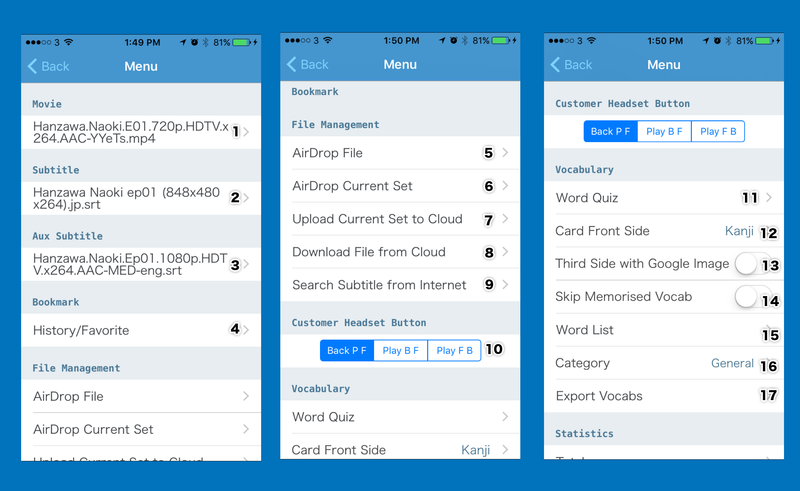 – Usually all movie, song, subtitle and lyric files are put into the App by iTunes. In iTunes, select your iPhone device, then select Apps and SABU shared folder. Drag the files to the folder. 4. Bring up the history / favourite menu. – SABU would remember what subtitle files you chose for a movie before. The next time you select the same movie, the corresponding main and aux subtitle ( and also main and aux language ) would be populated. 6. 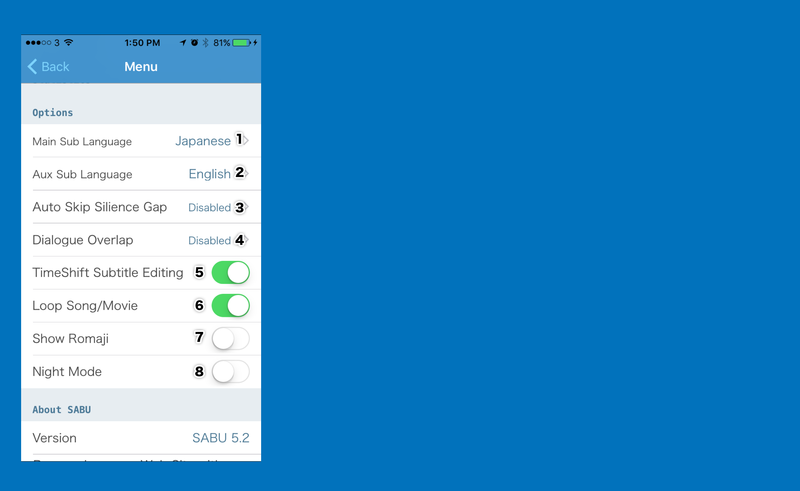 Airdrop current set to another device with SABU. Current set means current movie, main and aux subtitle. 9. Search subtitle from Internet. It would search and download subtitle from opensubtitles.org for the criteria you choose. 10. Change the action for the headset button ( single, double and triple click ). Default “Back PF” means single click to back one dialogue, double click to play or pause, triple click to forward one dialogue. 12. Select the front side of the quiz card. Default is Kanji on the front, reading, meaning and sentence on the back. You can choose the reading or the meaning and sentence ( with the word replaced with underscore ) on the front with the other info on the back. 14. Skip Memorised Vocab. A vocab is regarded as memorised when it is marked as “Easy” 4 consecutive times in about 1 month. After that, it would be rescheduled with longer interval ( intelligent spaced repetition ). As you build up more vocab ( like in range of a few thousand ), you may want to concentrate on new words and skip those memorised. 15. Display the vocab list. 16. Change the vocab category. This affects the default category for newly added vocab and the category of vocab to be studied in the word quiz. 17. Export Vocab. The vocab list would be in CSV format and can be used readily in other Apps like Anki. The resultant file is also placed in the App Shared Folder. You can choose to export only new vocab, or include the corresponding Movie clip for each vocab. 1. Main subtitle language. Usually it is Japanese. Note though it only has Japanese dictionary, you can use it for studying any language considering it has integrated iPhone’s built-in dictionary and web search. When it is English, press and hold would select word delimited by space. When it is Korean, the romanised word would be appended to the main subtitle. This also affects the language of the newly added vocab and the language of vocab to be studied in the word quiz. This also affects the filename of the newly made lyric. For example, when it is Japanese the new lyric filename would end in jp.srt. 2. Aux subtitle language. Usually it is your native language. This also affects the filename of the newly made lyric. For example, when it is english the new lyric filename would end in en.srt. 3. Auto Skip Silence Gap. This skips the silence gap between two dialogues when it is longer than the time you select. This is very useful when you just want to focus on conversation dialogues only. 4. Dialogue Overlap. This add some margin when you do backward, forward or looping. This is useful when a long and fast sentence is across two dialogues and you want to hear a bit more before and after the dialogue. Enabling this also makes editing dialogue timing easier. 5. Time Shift Subtitle Editing. When this is turns on and you adjust the beginning time of the current dialogue, all subsequent dialogues would be adjusted the same time. Good for cutting advertisements. 6. Loop song / movie. Loop to the beginning when it reaches the end. Good for listening to song. 7. 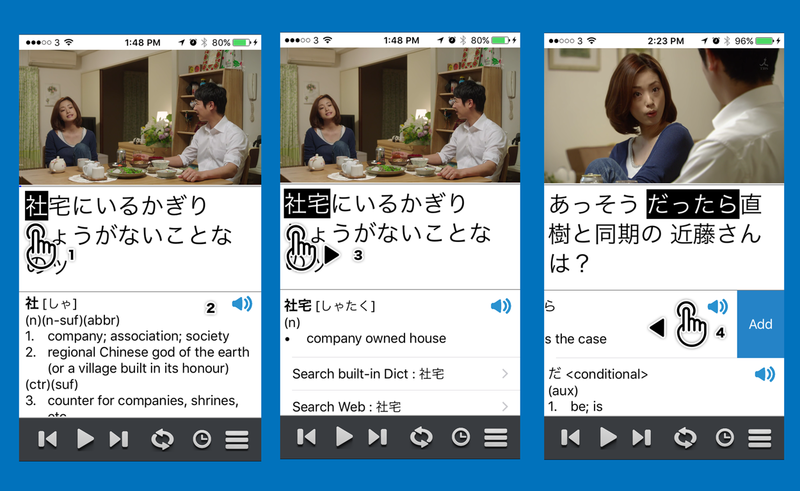 Show romaji in dictionary entry. 8. Night mode. Change the subtitles and dictionary pop-ups in dark background for easier reading at night. Refer to Quiz Cards page. 1. Dialogue Area. The text you want to type. 2. Number of seconds elapsed when you start to type. 3. Average speed for this typing session. 5. Area to type the text.